We pack Painting in Transparent Poly cover. We use Card Board to give strength in Packing.Use Good Quality Envelop for Master Packing. We offer customized Packing at extra Cost. 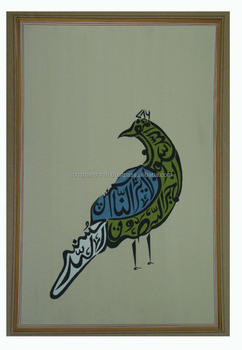 This is highly talented and skilled artists produce the ostentatious paintings on paper sheet. This artwork is vivacious because of strong gestured strokes and vibrant colors. It is the concept of beauty of the artist which results in the manifestation of such works. Bold colors have been used in an aesthetical manner resulting in the composition appearing thoughtfully balanced. The symmetry in the compositions is remarkable. The Quranic verses along with the beauty of color enhanced with the glitter and splendor of Islamic motifs enrich the artwork to provide visual pleasure. We Will ship within 2-3 Days through courier service and You will get delivery within 10 to 15 Days after shipping the Product. Duty,Octroi, Entry Tax and any other Local Taxes at Buyer’s State / City are Not Included and the Buyer Has to Pay When Demanded by the Courier / Shipping Company. We Offer Priority Shipping By FedEx /DHL At Extra Coast.